If you want to dive right into the site to look for herp care information, find a reptile vet or a herp society, or check out the other information resources here, use the links on the left. Information about the site itself, about me, and some other things some folks are interested in, check out information below. 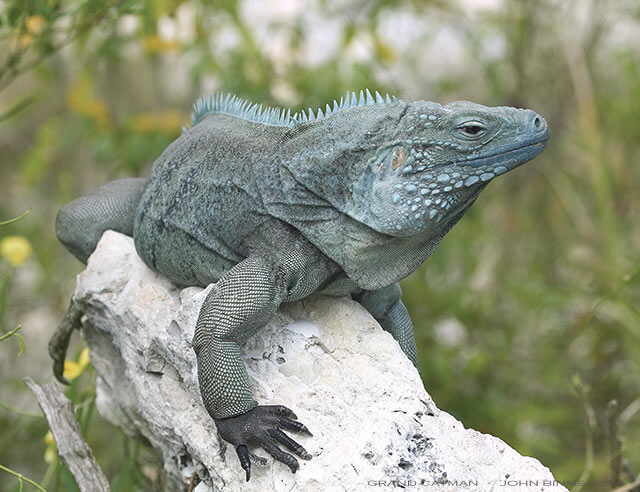 The Blue Iguana Recovery Fund helps fund ongoing conservation efforts in breeding-for-release, community education, and habitat conservation programs in the Cayman Islands for the endangered Cyclura lewisi. Help support their work by making direct donations, or buy one of their new King Blue Bobbleheads! Many people wonder why I chose such a goofy/strange/dumb name for my herp site. Once you find out what anapsid means, I trust you won't find it so goofy, strange or dumb. I reserve all rights to my work. VeterinaryPartner.com uses my material with my permission and my thanks. As will become apparent when reading many of my articles, I am an animal welfarist. I strongly believe that if humans are going to keep animals--in any setting--we have the responsibility, the obligation, to care for them properly. Unfortunately, care information for many species now being imported is lacking, while information that exists for many others is so wrong that it would benefit those species if the information did not exist at all. All new animal keepers make mistakes. I feel that it is the responsibility of those who have walked that path before to share as much information as possible so that the newcomers will avoid the mistakes we made. Hoarding information is as bad as hoarding animals. No one benefits, least of all the animals. Another personal point of view will also be seen to emerge in many of my herp writings. This particular point of view stems from the things I have had to learn, often the hard way, after being stricken with with several illnesses, including those that affect my neuroendocrine and immune systems. While the ways in which I was exposed to chemicals and tickborne diseases may be unique for someone who was for so long a strictly urban creature, the fact remains that I am far from unique in a world where every living thing has become a guinea pig for the chemical stew which surrounds us every day and every night. Stress exacerbates all illness and can make healthy people--and animals--ill. Animals in captivity are under constant stress, even those kept in the most perfect of environments. And so you will see me make recommendations and cautions that are apparently contrary to everything else written by those who write about animal care. Few of those authors, however, share my own experience and learning in these areas. My bottom line is always the health and functioning of the animals and their keepers. That is why my Chronic Neuroimmune Diseases and Lyme Disease sites is are part of my Anapsid site. Why Help Support This Site? I had to take my site down in 2001 because of new traffic (bandwidth) charges assessed by my Internet service provider. The World Wide Web and surfing the 'Net may be free other than someone paying an ISP for access, but the WWW is anything but free for those providing content. Veterinary Information Network stepped up and gave me a place to put my site back online, but there are still ongoing expenses that are tough to make when you are unable to work for a living. That's why I set up the Support This Site page: a way for herpers to get things they need while helping to keep this site on the Web for everyone else to use. To a larger extent, my site format and design decisions are based on some things most webmasters of individual sites don't take into consideration when designing theirs. This site is to help herp keepers and others learn about the captive care requirements of many types of reptiles and amphibians, as well as learn about their biology, health, behavior, conservation, and other matters relating to herps and the world we all live in.Most of the information here is herpetological or herpetocultural in nature, including many of my articles and care documents, links to certain other sites, and some other things that I find important but that may or may not interest you. But that's the beauty of hypertext: you can always link out! Please take some time to familiarize yourself with the layout of this page and cluster pages At last count, there are over 1100 articles arranged in several thematic clusters. I do hope you will take some time to browse through the cluster pages (see the links to your left, which also appear at the bottom of every article page). Many people note the paucity of graphic images at my site. That is intentional. Most visitors are thankful that they don't have to wait for images to develop before they can get to the information or have to backtrack and turn images off in their browser and then remember to turn them back on again. Bottom line is that there are still a goodly number of folks out there without high-speed modems and graphics capabilities or slow phone lines with no DSL in sight. Whatever the reason, there is a significant number of people who don't want to wait for graphics that have little to do with the subject matter to load. There are many sites with wonderful graphics, so no one is being deprived. I've also received mail from some very phobic folks who were grateful they didn't have to shudder through pictures of snakes to get to the articles they were interested in. If you want graphics, check the graphics sites linked to my Resources page. Along with maximizing the load time while still providing comfortably readable formatted text, my second concern is to keep the site widely accessible. There are many websurfers out there who have autoimmune, visual or other disorders or impairments that make it impossible for them to use newer computers, or difficult to navigate a site with all the latest bells and whistles as well as lots of cute graphics, photos, JAVA scripts, applets, etc. While many webmastes address the differences between browsers and Mac vs. Windows, most seem not to realize or care about those still using older computers,or UNIX or Lynx. There are a huge number of disabled people and others who simply cannot afford to upgrade their equipment as often as they would like. Since my site is all about providing information, its format and design is geared towards being easy to access and read for as many people as possible.